If you made a purchase a Books-A-Million store recently, you can now go to the website www.TellBAM.com to participate in the Books-A-Million Customer Satisfaction Survey. Once you complete the survey, you’ll receive a coupon for $5 off your next purchase of $25 or more. Plus you can also receive a chance to win $1,000 daily and other great prizes valued $1,500 weekly. Just have your Books-A-Million sale receipt handy and open the survey link www.TellBAM.com, then enter the survey entry code from your receipt to start the survey. In the next, you’ll need to answer a list of questions regarding your shopping experience. At the end of survey, you’ll receive the $5 off $25 coupon immediately. The coupon is valid 30 days from the date of survey. And you’ll be entered into the customer sweepstakes automatically. If you often buy books at Books A Million store or Booksamillion.com, remember to redeem following Books A Million coupons to save more money on your purchase. 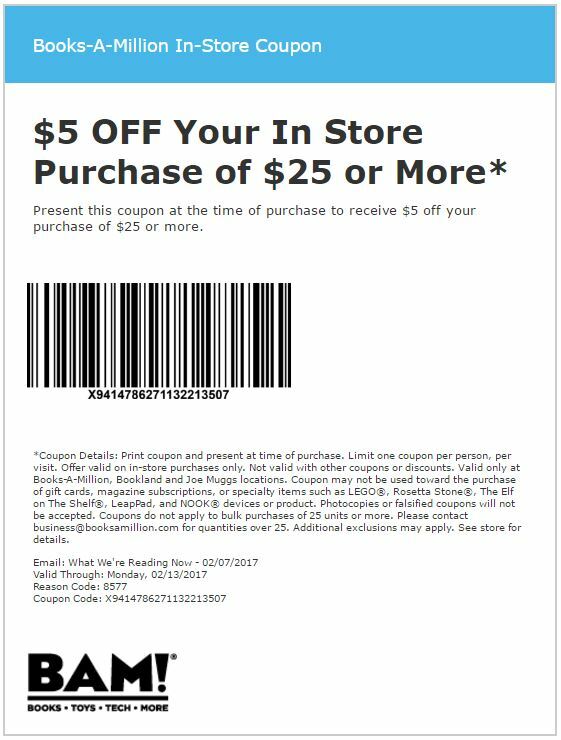 $5 off Books A Million coupon – Enjoy $5 off your in-store purchase of $25 or more. Expires 2/13/2017. 9 Books A Million In-Store Coupons – $10 off $50, 20% off Toys and Games, Any Cookbook, Headphones & Any Fiction Title, and more. Join Millionaire’s Club & Get 10% OFF – To get a 10% discount on your Booksamillion.com purchases for a full year. Millionaire’s Club members will receive free Wi-Fi access in-store. 8 Comments on "Enter Books-A-Million Customer Satisfaction Survey"
looking for or have a question. I signed up to receive discounts and coupons on Sept. 7th and paid my $25 then at the Dubuque Ia store. I have fill out your required survey and have emailed you once already about not receiving any email coupons back. I am disgusted and want a refund. No one at your company is replying to me. Not happy at all. While drinking my coffee I observed Scott interacting with a mental challenged young man. It was obvious that the young man was very fond of Scott and was glad to see he was in the coffee shop that day. Scott was very patient with the young man and fixed exactly what he wanted. Great Job!! Well Done. I purchased 3 books of the WARRIORS POWER OF 3 series for my grandson The books were clearly each marked with a price of $6.99 per book. The salesperson ID : 136996 charged me $7.99 per book. This was at the store in Gulf Shores, AL. Just printed a coupon after recent purchase. “Valid through 12/09/13. What gives.